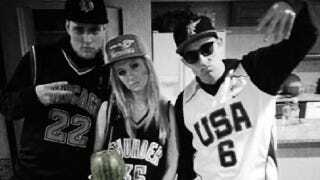 Arizona State University officials have acted swiftly this week, choosing to sever all ties with Tau Kappa Epsilon, the fraternity responsible for the "MLK Black Party" where attendees were dressed in basketball jerseys, flashed gang signs, and drank from watermelon cups. That doesn't mean, however, that the members of TKE comprehend what they did wrong. ASU officials suspended TKE on Monday. In the days since, local civil rights leaders have been quite vocal about their wish for the fraternity to be banned from the University, according to the Arizona State Press. By Thursday, ASU decided they would no longer recognize the chapter as part of Greek life at the University, mostly because this recent event came after TKE was put on probation in 2012 for beating up a black member of the Delta Kappa Epsilon fraternity. Two of the men involved in that attack pled guilty to charges of aggravated assault, according to The Arizona Republic. DKE was also suspended. The University says TKE broke several rules, including some involving consumption and distribution of alcohol, hosting an unregistered party, and "Engaging in discriminatory activities, including harassment and retaliation, as prohibited by applicable law or university policy." In a statement, University officials said that they would continue to investigate members of the frat and may take further action. In evolving a new model for inclusive 21st century higher education, Arizona State University takes to heart its essential responsibilities to educate young adults and to support their character development as part of the learning process. Teaching and nurturing integrity within our diverse university community is a significantly complex challenge, but one to which we are wholly and unwaveringly committed. Universities bear an intrinsic responsibility to advance the intellectual growth of their students through learning experiences that result not only in a diploma, but also in the vital maturation of their individual character. Accordingly, the ASU Student Code of Conduct sets forth the standards of conduct expected of students who choose to join our university community. At ASU, students who violate these standards will be subject to disciplinary sanctions in order to promote their own personal development, to protect the university community, and to maintain order and stability on our campuses. Crow's statement and the University decision to expel TKE are not just about this one fraternity or this one racist party (parties that don't seem to be going out of style); they're a response to a serious culture of danger and misconduct in Greek life at ASU. Last March, two teenage girls visiting ASU as prospective students were seriously burned at the home of a Sigma Alpha Epsilon member after someone threw vodka on the fire. In June, ASU expelled SAE after a member of the frat passed out after drinking too much and was abandoned at the hospital by his brothers "with a Post-it note with his name and number stuck to his chest," the State Press learned from the police. Before that, a pledge drowned in a river after he was kicked out of a SAE party. In September, the Republic put the discipline histories of ASU and Northern Arizona University online. In 2013, SAE and Pi Kappa Phi made it onto Rolling Stone's list of "The Most Out-of-Control Fraternities in America." &apos;Pedo Parties&apos; and Racist Ragers: Why Are Frat Bros Fixated on Fucked Up Theme Parties? The national organizations for all these fraternities have stated that they do not condone the actions of their local chapters. At the ASU level, the several years of terrible news about the state of Greek life prompted fraternities to announce in September that they were reevaluating their actions, while local police stepped up their attention to the system. Some reports have indicated that a complicated real estate deal with the University that recently forced the fraternities to move out of frat row and into off-campus apartments exacerbated their problems. Some believe issues will resolve as more members move back into specially designated on-campus homes for Greek organizations. Full support on the issues of freedom of speech and expressing controversial opinions and ideas. Save our consititutional rights. here's a pics from 1990 at Kent state univ. when TKE was allowed to express our rights. if the university or TKE nationals causes you problems, ,seek independent legal advise. More throwback, 1990, Who is that dark skinned brother on the left ? . Kent State , TKE fraternity party, back when we were allowed to express ourselves. damn, times have changed for the worse.